I think I've taken toilet paper to a whole new level of elegance here don't you! Yep, you read that right, I used another one of my handmade embossed toilet paper creations for the background. 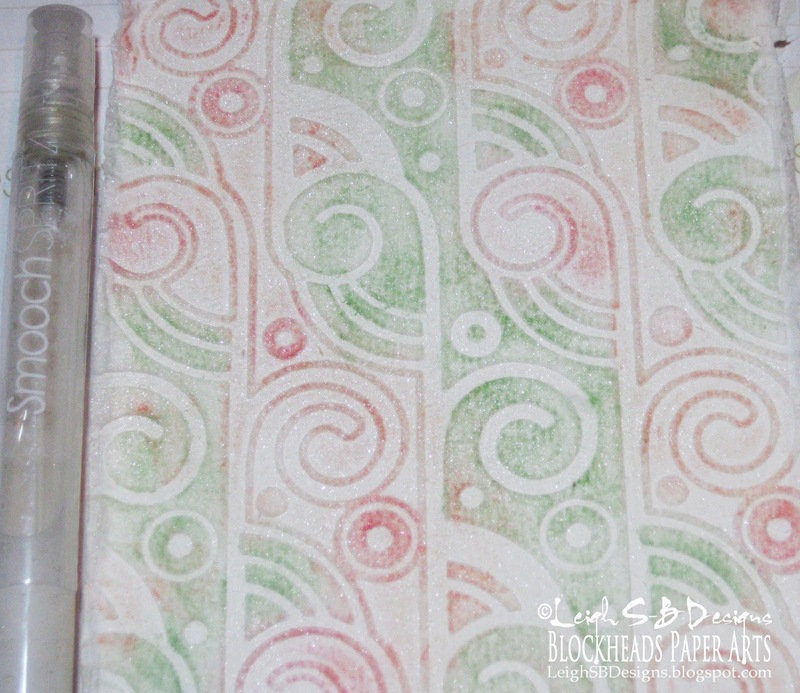 I used an Art Deco Cuttlebug embossing folder on this one and was inspired to go with an Art Nouveau colour scheme and the layout of the sketch challenge #148 over at Tuesday Morning Sketches. I used the goddess frieze from the Greco-Roman sheet (top right) and the Congratulations sentiment from my favourite Verses sheet. Both are exclusive Blockheads Paper Arts' sets. 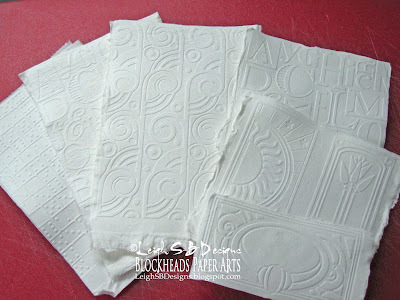 Check out my Blockheads Technique Challenge tutorial on making your own handmade embossed toilet paper (ETP). 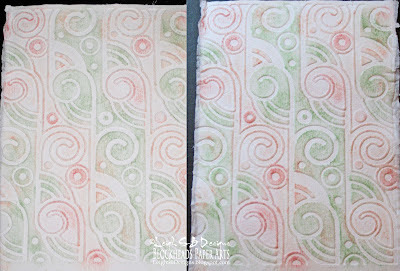 I used a Cuttlebug embossing folder to emboss this piece of ETP and applied sage green, peach and a touch of pale pink Pebble Chalks with my finger tip instead of using a chalk applicator. During my experiments I found that being too rough with colour application can cause the ETP to get bitty and using my finger helped keep it to a minimum! 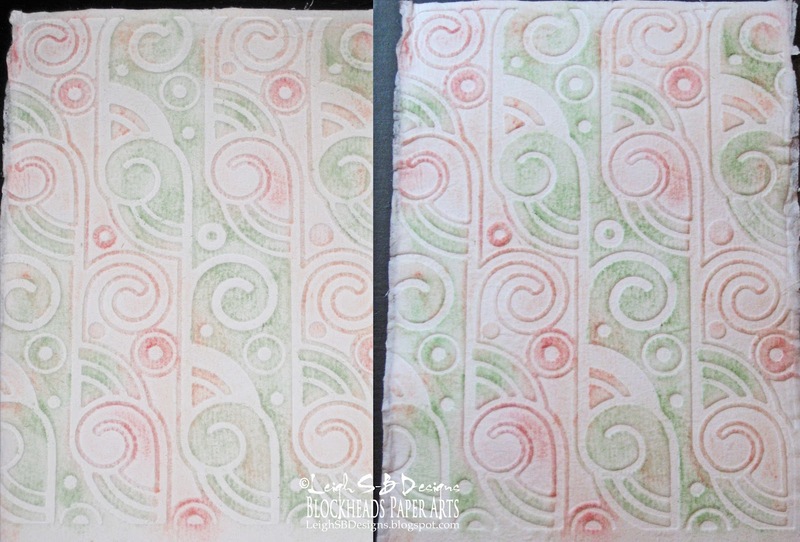 The left pic above shows the soft effect of the chalks and the pic on the right shows how much stronger the colour becomes after spritzing it with water. To make the background even yummier I added a wonderful diamond shimmer to it by spritzing with Smooch Vanilla Spritz. You can click on the pic below to enlarge and see the pretty sparkle. The ETP is the perfect size to fit onto a 6.5 x 5 inch card blank (Michaels). Cut a mat from sage green cardstock slightly smaller than the folded card and adhere the ETP panel to it with craft glue. 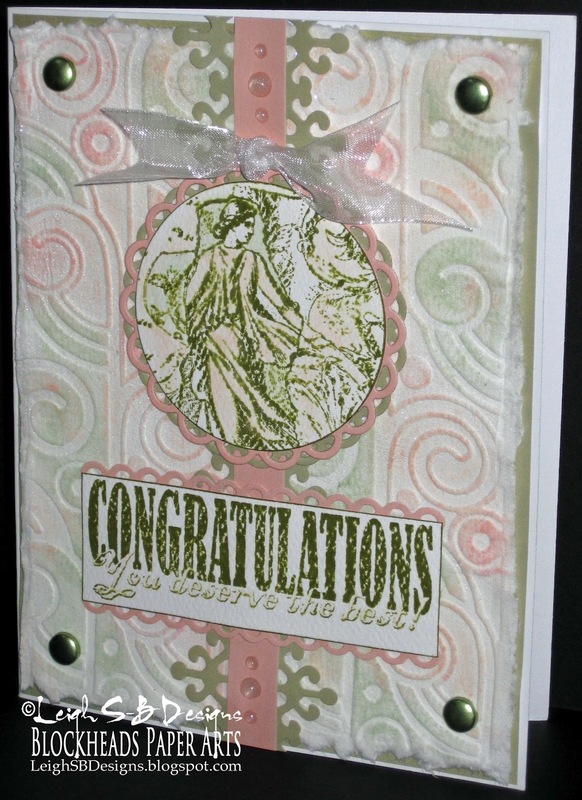 Punch holes in all 4 corners and attach sage green pearlized brads (Recollections - Michaels). Adhere everything to the folded card with craft glue. Die cut out 2 strips of the Spellbinders Ironworks border die from the same sage green cardstock then cut a strip from a sheet of pearlized peach cardstock and adhere down the center of the card. 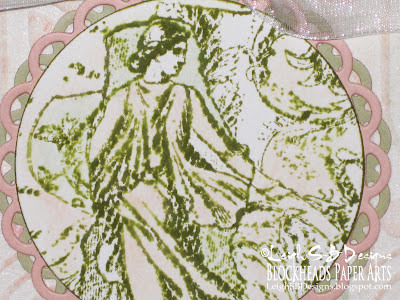 Stamp the goddess frieze onto textured white cardstock with Peeled Paint Distress Ink. For a touch of subtle colouring apply sage green and peach Pebble Chalks to parts of the image with a detail chalk applicator and blend with a Dove Blender pen or E-Z Chalk Enhancer fluid. 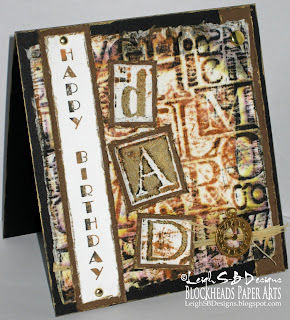 Die cut out the image with a round Spellbinders die and edge it with the Peeled Paint DI. Die cut out mats for the panel with a Spellbinders Lacey Circle die from green and peach cardstock. Overlap the mats and adhere everything together with permanent adhesive tape. 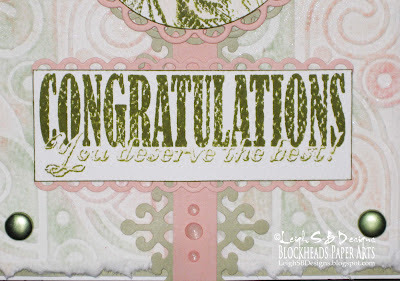 Stamp the sentiment onto textured white cardstock, cut out and edge with Peeled Paint Distress Ink. To make the 2nd part of the sentiment stand out a bit more I coloured it lightly with peach Pebble Chalks and a Dove Blender pen. 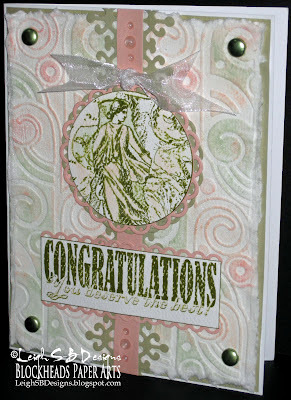 Die cut out a rectangle panel from peach cardstock with a Quickutz Lacey Rectangle die. Cut the die cut in half and just adhere the lacey edges to the back of the sentiment panel with permanent adhesive tape. Adhere the goddess panel and the sentiment to the card with craft glue. I've entered my card in these fun challenges! I am in complete awe of your card and your amazing handmade embossed papers. I cannot believe you did that with toilet paper. I am off to read your tutorial. Simply fabulous! This card is absolutely stunning and any bride would be happy to receive this. Thanks for joining us at Tuesday Morning Sketches. PS - The TMS DT call is open until June 9th. What a wonderful card, very soft colours and a very different bride look! oh my, your blog is filled with fabulous creations & awesome techniques! Thank you for all your wonderful comments on my alternative wedding card!! Wow, never would have guessed that was toilet paper - amazing! 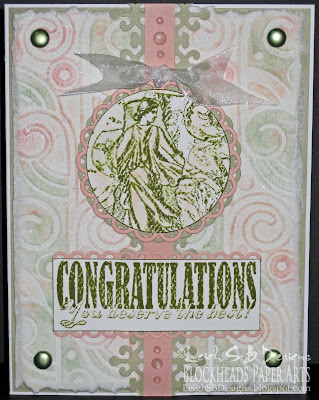 Beautiful card, thanks for playing along at Fab N Funky this week! 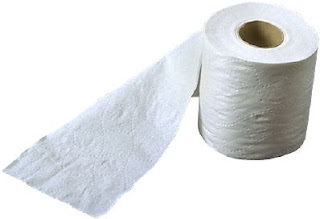 TP never looked so good. Gorgeous colors! Is the stamping done in the new Memento colors? Great layout!! Leigh: Both of your cards--so beautiful--as beautiful as last week's winning entry! 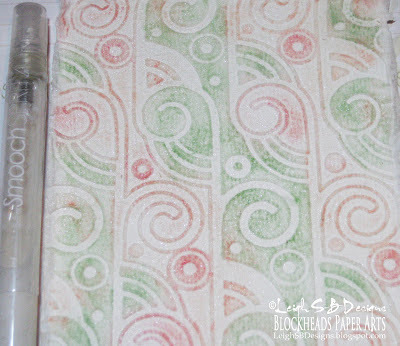 I've done the TP & Stamps before--now I'll have a new trick--thanks for the fun/great tutorial--you explained and pictured it so wonderful.Thank you for entering your project in our Challenge #14 - Wedding [Love]. I've seen thsi technique on Create and Craft so it is good to see it used elsewhere. Lovely creation. Thanks for playing at Aud Sentiments. What a fabulous technique. What brand of TP do you use for your embossing? Must be rather strong. Gorgeous card. Thanks for joining us at Perfect Sentiment. Very pretty, love the swirl embossed background and the pastle colours. What a beautiful - and unique - wedding card, Leigh! Toilet paper, eh? YOu are so green! !